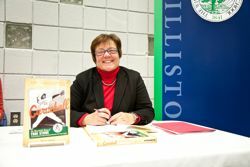 “We are more authentically human when we embrace diversity,” Mount Holyoke College professor Martha Ackmann told the assembled Williston Northampton School community at the start of the 10th annual Diversity Day. The day would be filled with a variety of workshops—on everything from cyber bullying and Islamic awareness to Zumba and hip hop. But the morning was devoted to a trailblazer from the past: Toni Stone, a female baseball player whose grit and determination in the face of racism was on the leading edge of the civil rights movement. See the full photo gallery from Diversity Day. A Pivotal Moment: Dr. Duane Jackson on Meeting Dr. Martin Luther King, Jr.
Dr. Duane Jackson was 17 when he met Dr. Martin Luther King, Jr. for the first time. On Monday, in commemoration of the minister and his works, Jackson recalled that day for the assembled student body of The Williston Northampton School. Check out photos of Jackson’s visit on Flickr. Jackson’s keynote was the highlight of events designed to celebrate the life and work of Dr. Martin Luther King, Jr. and the diversity that his efforts inspired. 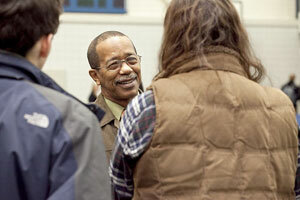 Other events included a Friday-night lecture on cultural diversity with four members of the Williston community. While he would begin the day describing de facto segregation, 1960s sit-ins, and racism, by mid-afternoon, Jackson would be deep in discussion about the mating habits of lightening bugs and defensive strategies of butterflies. In his keynote, Jackson took his audience back to the deep south of the 1960s and what he called the “Cotton Curtain”—the racial equivalent to the Iron Curtain of communism. “You would look on TV and see dogs and water hoses” being turned on protesters, Jackson said. Jackson, who had been born and raised in Chicago, said that he had initially had big plans to attend either the University of California, Los Angeles, or the University of Hawaii. When his father pushed his alma mater of Morehouse College in Atlanta, Georgia, 17-year-old Jackson resisted. The two visited the College and neighboring area, but Jackson still refused. Finally, in a last-ditch attempt, the elder Jackson took his son to the lobby of an Atlanta office building. Jackson would meet King again during a protest march in Atlanta when the minister stepped in to prevent supporters and rally opponents from coming to blows. 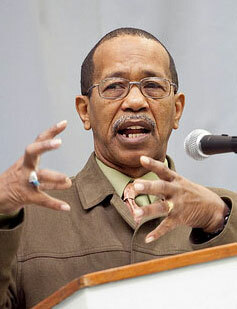 Jackson urged the Williston Northampton students to use the King’s model of non-violent action—and incorporate modern tools such as cell phones and Twitter—to make their own positive changes. In the afternoon, Jackson stopped by the Williston Northampton Middle School to talk about African-Americans contributions to science. The seventh- and eighth-graders listened carefully to his description of the contributions of George Washington Carver, Charles Turner, and Earnest Just. Jackson concluded the talk with a few quirky facts on insect behavior and hands shot into the air. “Can fireflies bite?” asked one girl. “Have you ever eaten any bugs?” asked a boy. “What is the firefly glow made of?” asked another boy. The answers came just as quickly: no, their mouths are too small; yes, lemon ants which taste like lemon drops; it’s made of two chemicals that mix to form bioluminescence. When a student then asked why he studied insects—rather than animals or birds—Jackson paused.